Posted 9th May 2012 by Myfanwy in Advice. If you work for a transport company, large or small, this post is for you. It’s for anyone who runs buses, trains, trams, an underground system, or even an inland ferry. It aims to point out some of FixMyTransport’s many benefits for operators. …and would cost you absolutely nothing to implement? FixMyTransport is an independent website which will bring you all those benefits, for free. FixMyTransport was built by the not-for-profit organisation mySociety. We have a background in creating websites that make it easy to access civic and democratic rights. Our previous projects include FixMyStreet.com, WhatDoTheyKnow.com and TheyWorkForYou.com. FixMyTransport uses the same basic idea as many of our other websites: it encourages complete transparency from both the customer and the operating company by publishing all correspondence online. This allows others to read and comment on problems, suggest solutions, or add their thoughts to the debate. It also creates a permanent archive of the problem and any explanations or solutions offered by your company. If that sounds daunting, read on. Until very recently, operators have been accustomed to dealing with passenger complaints through the private channels of email, phone and post. But, with the arrival of social media, an expectation has arisen among passengers. People want to contact companies by the means with which they are most familiar. Increasingly, that means via Twitter, Facebook, or other public online spaces. Those organisations that rise to the challenge are rewarded with loyal customers – customers who can, and will, spread their positive opinions to their contacts within minutes. Equally, they will not hold back if they perceive that they have received bad service. It can be hard to explain yourself within the confines of Twitter’s 140-character limit, or even Facebook’s status update box. FixMyTransport gives you as much space as you need to get to the bottom of your customers’ problems. You can reply as many times as required – and every time you do, you’ll be gaining brownie points not just with a single passenger, but with many thousands of other readers. We know that most operators are striving to offer excellent customer service. And what happens when you do? A single person is satisfied; perhaps they spread the word among a few friends and family. When fantastic responses are given via FixMyTransport, they stay on a permanent web page for all to see, now, and in the future. We’ve spotted that customers don’t always want a solution to their problem. When you explain the challenges you face and give reasons why your service may not have been up to scratch, it can go a long way. Why hide your light behind a bushel? If you are investing a lot of effort and money in improvements, you should be shouting about it. The average passenger doesn’t understand the complexities of timetable management or staff training. Much of the hard work you do goes completely unseen. Try putting a full explanation on FixMyTransport. You may find that it soon becomes the top Google result for a search like “why don’t bus drivers carry change?”. Not only are you educating people, but you’re also getting a chance to put your brand name out there, as a knowledgeable expert. FixMyTransport works by grouping people together when they have the same problem. That means you only receive one email where previously you would have been repeating the same response to several passengers. And you only need reply once, too – your reply goes to everyone who has added their name to the issue. How much does it cost you, in real terms, to answer one email or phone call? Now you can strike that off your balance sheet, times several hundred. It’s not just your present customers who you’ll be responding to – for repeated or persistent problems, FixMyTransport can act as a permanent record that anyone can consult in the future. Do you ever conduct focus groups or run customer insight questionnaires? Now all the information you seek is readily accessible, for free. Your passengers are talking about your services right now on FixMyTransport. What upsets them? What would please them? What do they expect? It’s all there in black and white – and if anything is missing, there’s nothing to stop you dipping right in and asking them directly. The kudos you gain from being one of the first transport operators to take the plunge and interact directly with passengers on a site like FixMyTransport is invaluable. You may well find that it’s a move that is picked up and praised by mainstream and industry press, as well as countless bloggers. That’s what we mean when we talk about free PR. Anyone who’s consulted a social media agency will have heard the first rule of social media for businesses – go where your users are. Your website may be the best in the business, but your passengers will never know that if they don’t visit it. If you have a social media strategy, the chances are, it extends to Facebook and Twitter. Now it’s time to find those passengers – more and more of them each day – who are using FixMyTransport as their preferred place to hang out. Form responses just won’t work on FixMyTransport: the site’s public nature means that our users will soon sniff them out. But wouldn’t you rather be giving your passengers individual, helpful responses that really please them? Any time you lose in putting them together should be well paid for in the free, positive publicity you get in return. FixMyTransport was set up so that you, as an operator, need never visit the site if you don’t want to. When one of our users sends you a message, it is sent to your customer services email address. At the same time, it is published on our site. All you need to do is reply to the email. Your reply is sent to the passenger. Depending on their preferences, it may also be published on their FixMyTransport page. So, at a very basic level, you, the operator, need do nothing out of the ordinary. You just reply to the message as you would to any other. However, if you would like to really seize the opportunities that FixMyTransport offers you, there are a number of extra steps you can take. Set up a company profile on the site. Simply register as you would as an individual user. You may wish to use your company logo as your userpic. If you are a large organisation, use a group email address, and choose a password that you are happy to share with your team. Use this profile to proactively comment on the issues that are addressed to your company. How do you find them? On the Operator pages. 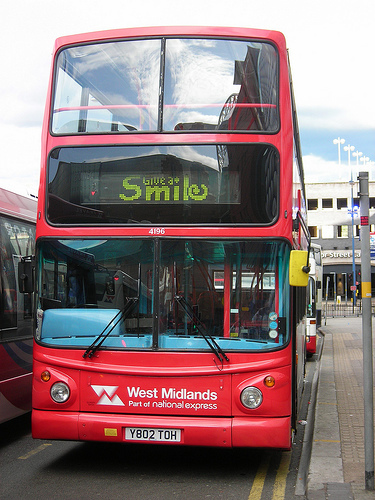 Browse all operators here, or find your page with this format of URL: www.fixmytransport.com/operators/firstword-secondword – eg, www.fixmytransport.com/operators/london-midland. Use our Atom feeds. You’ll find the link on every Operator page, next to this icon . Read our recent blog post to find out more about how to subscribe. Have you dealt with a problem particularly well? Don’t be afraid to use your own social media – Twitter, Facebook, etc – to spread the link around. Several transport operators have already created a profile and started interacting in this way, and we regularly hear that they have gone up in our users’ estimation as a result. We’d love to talk more about how we could make FixMyTransport work better for your company. Drop us a line and we’ll be happy to discuss any questions or ideas you have. We’re still in active development, so, in some cases, we can even make modifications to the site so that it works better for you and your backend systems. Image by Tim Ellis, used with thanks.